a Faculty of Economics and Administrative Sciences, European University of Lefke (Turkey). b Defence Research and Development Canada (DRDC, Canada). c Department of Economics, Eastern Mediterranean Univeristy (Turkey). d Undersecretariat of the Turkish Treasury (Turkey). The linkage between electricity consumption, internet demand and economic growth is aimed to investigate in this study in 35 OECD countries for the period 1993-2014. Panel cointegration, Fully Modified Ordinary Least Squares (FMOLS), Dynamic Ordinary Least Squares (DOLS) and Dumitrescu-Hurlin causality tests were performed to capture the potential long-run and causal linkages among the three variables. The findings from the FMOLS and DOLS models indicate a positive linkage between electricity, internet demand and economic growth in the long-run. Results from the Dumitrescu-Hurlin causality confirm feedback causality between electricity consumption and internet demand and unilateral causality running from economic growth to electricity consumption. El presente trabajo estudia la relación existente entre el consumo de electricidad, el crecimiento económico y la demanda de Internet para un grupo de 35 países de la OCDE para el periodo 1993-2014. Para obtener los coeficientes de la relación a largo plazo se emplean los estimadores FMOLS y DOLS. Adicionalmente, se aplica una prueba de causalidad en el sentido de Granger para datos de panel (Dumitrescu-Hurlin) con el fin de evaluar la relación de causalidad entre las tres variables. Los resultados de las regresiones muestran que existe una relación positiva entre consumo de energía eléctrica, crecimiento económico y demanda de Internet en el largo plazo. Los resultados de las pruebas de causalidad Dumistrescu-Hurlin confirman que el consumo de energía eléctrica causa la demanda de Internet, y el crecimiento económico causa al consumo de energía eléctrica. Energy and technology related topics are very common in the economics literature since the 1980’s, the beginning of globalisation. More specifically, there is a world-wide acceptable consensus about the importance of electricity and the Internet in our daily lives. This is because both electricity and the Internet are the engines of production in contemporary times. Accurate causal linkage between electricity usage and economic development play a crucial role in any policy formulation. From a strategic planning standpoint, unilateral causal linkage running from electricity usage to economic development, for example, would urge policy-makers to use policies that improve the generation and consumption of electricity for boosting economic development. It would also mean that conservation policies could enhance poverty and reduce societal welfare (Iyke, 2015; Ghosh, 2002). The long-run trend of electricity-related measures can shed light on the links between electricity usage and Gross Domestic Product (GDP). Electricity intensity and per capita electricity consumption have been the most frequently used indicators in the existing literature (Kim, 2015). It is not difficult to state that electricity consumption increased faster than GDP from the 1960’s to the 1990’s. However, the last two decades mirror that this situation turned into opposite direction, especially in the Organisation for Economic Co-operation and Development (OECD) countries. This is due to energy efficiency programs and the transition from manufacturing to service based economies (Kim, 2015). Per capita electricity power consumption (kWh) increased from 1993 to 2014 with an average increase rate of 0.77% per year (versus 6.69% for GDP). During the global economic crisis (from 2008 to 2010), this consumption showed an average growth rate of approximately -0.48% (versus 4.5% for GDP). The history of the Internet is relatively short compared to the invention of electricity, but advances in the Internet seem to have significantly influenced the economy. While income is unquestionably a significant determinant of internet access (Oyelaran-Oyeyinka and Adeya, 2004), the direction of the internet-growth relationship is, however, still ambiguous. The diffusion of the internet can promote growth, for instance, by reducing communication cost (Harris, 1998), improving labour productivity (Lloyd-Ellis, 1999) and enhancing trade and investment (Freund and Weinhold, 2004). In contrast, the internet can also have a substantial negative impact on employment, alter the consumption of various entertainment goods, and even become one of their main competitors (Hong, 2007). In 2015, internet users around the world represent 45% of the whole population (Internet World Stats, 2015). Internet users have been increasing since the early 1980’s in OECD countries. According to the World Bank dataset, 72.19 people out of 100 in OECD countries used the internet in 2012, and it is likely to increase. In 1994, only 1.77 people had access to internet out of 100 people in OECD countries. These numbers show a substantial growth pattern of internet access by people in OECD countries. This study is presented as follows: Following the introduction, section 2 presents a summary of the existing literature concerning the concepts of electricity consumption, internet demand and economic growth. Section 3 and 4 present the data and methodology employed in this paper, respectively. Section 5 provides the empirical findings. In Section 6, some concluding remarks and policy recommendations are made. Rapidly rising electricity consumption through the 1990’s and substantially increasing internet usage during and after 2000 have encouraged researchers to conduct research on the effects of electricity and the internet on economic development. However, a two-way linkage between electricity, the internet and economic growth remains a puzzle. The purpose of this study is to plug this gap in the literature. The exact directional causality between electricity usage and economic development is of crucial eminence in formulating policy (Iyke, 2015). The electricity-led growth hypothesis, states that economic growth is triggered by electricity usage. Narayan and Prasad (2008), for example, aimed to explore the linkage between electricity consumption and economic development for 30 OECD countries. The authors found that change in electricity consumption cause change in economic development for Australia, Iceland, Italy, Korea, Portugal, the Slovak Republic, and the United Kingdom. Bildirici and Kayikci (2012) examined this causal relationship in 11 Commonwealth Independent States. Their findings indicated that electricity usage causes economic development. More recently, Iyke (2015) investigated the linkage between electricity usage and economic development in Nigeria. The findings support the electricity-led growth hypothesis in not only the short but also the long run. The growth-led electricity consumption hypothesis assumes that economic development causes electricity usage. The findings of Chen, Kuo, and Chen (2007), Pao (2009) and Wolde-Rufael (2014) are in line with this hypothesis. Chen, Kuo, and Chen (2007), for example, investigated causality properties between economic development and electricity consumption for developing Asian countries. They discovered bilateral causality from economic development to electricity usage. Pao (2009) examined this causal relationship for Taiwan. The results indicate one-way causal link from economic development to electricity usage for both the short- and long-runs. More recently, Wolde-Rufael (2014) examined causal linkage between electricity usage and economic growth for 15 developing economies. Findings revealed a one-way relation of causality between growth and electricity utilisation. Yoo (2005) investigated this causal link in Malaysia, Indonesia, Thailand, and Singapore. The results indicate a two-way causal linkage for the first two countries. Squalli (2007) analysed the linkage between electricity usage and economic development for the Organization of the Petroleum Exporting Countries (OPEC). Findings indicate feedback relationship in five countries. In a more recent study, Solarin and Shahbaz (2013) tried to investigate the link between electricity usage and economic development in Angola and they found a feedback among the variables. Bayar and Özel (2014) also investigated the connection between electricity usage and economic growth in emerging countries. They found bidirectional causality between them by using Pedroni, Kao, and Johansen’s cointegration tests and the Granger causality tests between 1970-2011. Wolde-Rufael (2009) examined the long-run linkage between electricity consumption and economic development in 17 African countries. The author found no causality relationship for four countries. Chen, Kuo, and Chen (2007) investigated this causal relationship for China. The authors found no causal link for this country. More recently, Yoo and Kwak (2010) were also in favour of the neutrality hypothesis in different South American countries. A growing body of literature recognizes the diffusion of internet use as a crucial factor to economic performance (Noh and Yoo, 2008). This literature can be divided into two main branches. The first wave of literature examines the potential causal linkage between internet adoption and economic development. The other strand of literature investigates the effect of internet on electricity usage. Noh and Yoo (2008) investigated the internet, income inequality and economic growth relationship for 60 countries. The results showed that internet adoption has a negative effect on wealth for high income inequality countries because the digital divide due to income inequality hinders economic development. More recently, Najarzadeh, Rahimzadeh, and Reed (2014) studied the impact of the internet usage on labor efficiency utilising data on 108 countries. The authors concluded that labour productivity is positively affected by the internet. Andrés et al. (2010) explored the relationship between internet users and GDP per capita in 214 countries. They found statistically significant and positive relationship among the two variables. Baliga et al. (2011) researched the relation between energy usage and internet usage. They found that the percentage rate of electricity consumption increases as the access rate to the internet increases. Romm (2002) analysed the internet-electricity consumption nexus in the United-States. The findings indicated that internet use increases electricity efficiency, but it does not increase electricity demand. To the best of our knowledge, Salahuddin and Alam (2015) would be the first paper to explore the causal linkage between internet usage, electricity usage and economic development. Their results indicated that internet demand and economic development promote electricity usage in Australia. They also showed that electricity usage has not been affected by internet demand and economic development in the short-run. It is widely accepted that panel models are more efficient relative to time series models due to their more degrees of freedom (Hsiao, 2006). In addition, panel models have a better capacity to deal with more complex datasets relative to the time series models. Therefore, in order to have a comprehensive view about the relationship between demand for internet, economic growth, and electricity usage, panel models have superior properties over the time series models and in terms of efficiency. The paper is possible open new a debate in literature whilst the outcomes highlight remarkable implications for governors in the 35 OECD countries. A dataset on the 35 OECD countries, namely Argentina, Australia, Austria, Belgium, Brazil, Canada, Chile, China, Czech Republic, Denmark, Estonia, Finland, France, Germany, Greece, Hungary, Iceland, Ireland, Israel, Italy, Japan, Korea, Mexico, Netherlands, New Zealand, Norway, Poland, Portugal, Russia, Slovak Republic, Slovenia, Spain, Sweden, Switzerland, Turkey, United Kingdom, and United States, has been used in this paper to explore the linkage between electricity consumption, internet demand and economic growth. Annual data for 1993-2014 periods has been gathered from the World Bank dataset. As shown in Table 1, where the variable EC denotes the electricity power consumption in kWh per capita, IU and EG indicate the number of internet users per 100 people, and the GDP in current U.S. dollars, respectively. Electricity power consumption, internet users and GDP variables are employed for empirical modelling. The variables are employed in natural logarithm forms. Thus, the natural logarithms of EC, IU, and EG are used as proxies for electricity consumption, internet demand, and economic growth, respectively. Note: All variables in the models are presented in their natural logarithms. The long-run linkage between the electricity consumption, economic growth and internet demand variables for OECD countries was explored using panel cointegration tests. According to Granger and Newbold (1974), to have an order of integration of one, I(1), variables are pre-conditioned before performing the panel cointegration tests. As a first step, we checked stationarity properties of the variables by employing Levin, Lin, and Chu (2002), Breitung and Candelon (2005), Im, Pesaran, and Shin (2003), Maddala and Wu (1999), and Choi (2001) unit root tests. For each unit root test, the models are implemented with a deterministic trend and intercept. While Im, Pesaran, and Shin (IPS), Augmented Dickey and Fuller-Fisher (ADF-Fisher) and Phillips and Perron-Fisher (PP-Fisher) (Im, Pesaran, and Shin, 2003, Maddala and Wu, 1999, and Choi, 2001) unit root tests assume single unit root and the autocorrelation coefficients change for cross sections but Levin-Lin-Chu (LLC) and Breitung unit root tests (Levin, Lin, and Chu, 2002, and Breitung and Candelon, 2005) allow common unit root along cross sections. For the same order of integration -I(1) variables‒, cointegration linkage is investigated as a next step. As stated by Pedroni (1999), the Pedroni cointegration test is “based on pooling among both within dimensions and between dimensions. Pedroni (2001) has developed statistics that are based on pooling among dimensions, which will allow for heterogeneity in the autoregressive term” (Kirikkaleli, 2016, p. 213). Three equations are used to investigate the linkage between these variables. Equation , for example, explores the long-run impact from EG and IU to EC. In these equations, ρ i indicates country specific impacts, β i is the deterministic time trends and e it is the residual term, indicating the deviations from the long-run relationship towards short-run one. i = 1, 2, ..., N and t = 1, 2,..., T represent respective panel members and time periods. Where n denotes the number of lags, α1, α2, β1, β2, β3, and β4 are parameters to be estimated, and e 1t and e 2t are error terms. If variable M is not cause variable N, the parameters of N over the lagged M are mutually nil. Where u is an error term. We firstly check the stationarity properties of the variables by employing panel unit root tests. Panel unit root tests results are presented in Table 2. 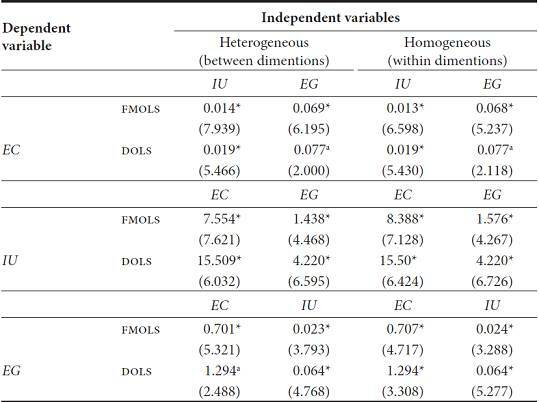 The outcomes clearly demonstrate that the order of integration of EC and IU is not I(0). For the variables of EG, the majority of the unit root tests point out that the variables are not I(0). At the first difference, Table 2 indicates that all investigated variables are I(1). These results allowed us to perform the Pedroni and Kao panel cointegration tests to check whether there is a cointegration equation among the variables or not. Note: *, a, and b represent 1%, 5%, and 10% significance levels, correspondingly. T&C denote that the model is performed with a trend and is constant. After analysing the pattern of the variables and showing the significance of the trend coefficients in the unit root regressions, the models are applied with an intercept and deterministic trend. As advised by Pedroni (1999) and Kao (1999), for the I(1) variables, Pedroni and Kao panel cointegration tests were used for the purpose of investigating the long-run relationships between the variables. 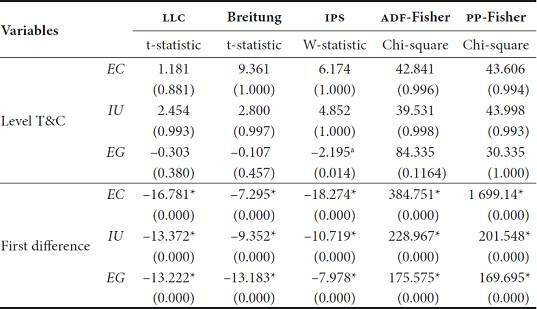 The outcome of the Pedroni panel cointegration test is summarized in Table 3, which indicates that 6 out of 11 statistics in model 1, 6 out of 11 statistics in model 2, and 7 out of 11 statistics in model 3 are significant at the 5 % level. This suggests that no cointegration null hypothesis for all models can be rejected. The findings from the Kao panel cointegration test for all models are in line with the findings from the Pedroni panel cointegration test as shown in Table 3. Hence, both results confirm the existence of a long-run cointegration relation between electricity usage, internet demand and economic growth. Note: *, a, and b denote 1%, 5%, and 10% significance levels, correspondingly. Table 4 illustrates the outcomes of the FMOLS and DOLS estimates for the three models. The findings are particularly consistent with existing literature. The economic growth in FMOLS models has both statistically significant and positive effects on electricity consumption in the long-run. The coefficients range between 0.068 and 0.069, indicating that a 1% increase in economic growth leads to between 0.068-0.069% increases in electricity consumption. The reverse effect is also positive and significant as expected. This findings support the feedback hypothesis where there is a bi-directional linkage between economic growth and electricity consumption. The FMOLS estimates of the elasticity of internet demand with respect to economic growth ranges from 0.701 (between dimensions) to 0.707 (within dimensions). The coefficients are statistically significant and positive, implying that internet demand has a positive effect on economic growth in 35 OECD countries in the long-run. Table 4 also demonstrates that there is positive and statistically significant relationship between internet demand and electricity consumption in 35 OECD countries in the long-run, suggesting that higher internet demand is associated with larger electricity consumption in the long-run and vice versa. When the demand for the internet increases, the IP traffic will also increase and thereby the number of necessary equipment will also increase in order to provide more internet service access. Therefore, electricity consumption increases. This is consistent with the findings of Baliga et al. (2009) and Baliga et al. (2011). It is worthy to mention that the findings of the DOLS results are also consistent with the findings of FMOLS at the 5% level in all cases. Note: *, a, and b denote 1%, 5%, and 10% significance levels, correspondingly. ( ) denotes the t-statistics. It is worthy to mention that as a robust check and based on the referee’s suggestion, we also performed models with control variable which is research and development expenditure as a percentage of GDP. Our results revealed that neither sign nor significant of the coefficients were changed after adding the control variable to the models. Since the aim of this paper is to investigate the link between electricity consumption, internet demand and economic growth, the result of the models including research and development expenditure as a percentage of GDP variable are not presented in this paper. In addition, we split 35 OECD countries into two clusters as a European Union and non-European Union countries and re-performed models; we again find that the results are consistent with the one in Table 4. In addition to the FMOLS and DOLS models, we also applied the Dumitrescu-Hurlin panel causality test to detect whether there is a relation of causality between economics growth, internet demand, and electricity consumption in the short-run. Panel causality tests reveal that the null hypotheses of electricity consumption and internet demand do not cause economic growth can be rejected at the 5% level, implying that the variations in electricity consumption and internet demand in the OECD countries significantly lead to changes in economic growth. Table 5 also reveals that changes in economic growth significantly result in variations in electricity consumption. This finding is parallel with Chen, Kuo, and Chen (2007), Pao (2009), and Wolde-Rufael (2014) findings. Finally, results indicate that variations in internet demand significantly lead to changes in electricity consumption, at the 10% level. Understanding long-run and causal linkages between electricity consumption, internet demand, and economic growth plays a decisive role in policy formulation. While some studies has explored the relationship between: 1) economic growth and electricity consumption, 2) economic growth and internet, and 3) internet and electricity consumption, to the best of our knowledge, the use of a single panel dataset relationship among the three variables remains unexplored. This paper examines the linkage between these variables in 35 OECD countries and fills this gap in the literature. The analysed data was drawn from the World Bank dataset and covers the period 1993-2014. Advanced panel econometric techniques were used to investigate this question. Findings from FMOLD and DOLS estimators reveal that the connection between electricity consumption, internet demand, and economic growth is positive and eminent in the OECD countries in the long-run. From a strategic planning point of view, this result would reject any conservation policy and imply that the generation and consumption of electricity and internet would accelerate the economic growth. It is also typical to find a positive impact of economic growth on electricity consumption and internet demand. A higher economic growth would more likely expand the domestic market size and increase internet and electricity demands in return. Dumitrescu-Hurlin panel causality test reveals a mutual relation of causality between electricity consumption and economic development. This result supports the feedback hypothesis of Yoo (2005), Solarin and Shahbaz (2013), and Bayar and Özel (2014). In addition, we found two unidirectional causalities running from internet demand to electricity consumption and from internet demand to economic growth at the 10% level. As new data emerge, further research should be done to investigate the connection between electricity usage, internet demand, and economic development in order to find whether our findings are consistent. This study can be implemented for different countries, especially in developing countries, to observe the linkage between electricity usage, internet demand, and economic development.